A Strange Sight to Behold! This is what you get when "Party Patrol Boot Camp" (whatever the heck that is) is scheduled on the same day as Literacy Lauchpad's squid story! 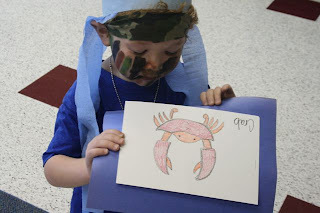 It's Rambo Squid! ... Or feel free to interject your own funny caption in the comments section! I bet you've got some good ones! 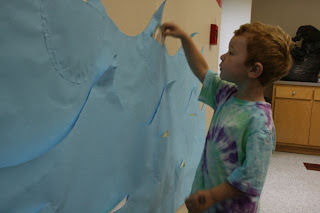 We wrapped up our ocean themed unit for the month of July! 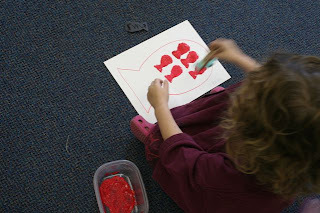 Our story this week was I'm the Biggest Thing in the Ocean by Kevin Sherry. I presented the students with these homemade (obviously?) 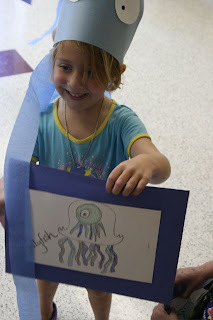 squid hats, and we played a musical chairs-type game that helped reinforce what we learned in the story about all the ocean creatures that squids are - and aren't - bigger than. If you haven't read this clever book yet, it's definitely worth checking out. It's perfect for a read aloud. 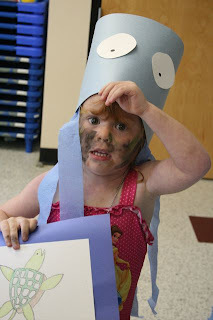 I especially love to watch the students react to the squid getting eaten by the whale. Priceless! Oops! Did I spoil the ending? Nah! That's not quite where the story stops. Seriously. Go read it! Party Patrol Boot Camp involved some kind of swimming or water play activity; hence the swimsuits you see in many of the photos. My first group of students were scheduled to go to boot camp after Literacy Launchpad, so they were completely distracted during class as they eagerly anticipated this event. 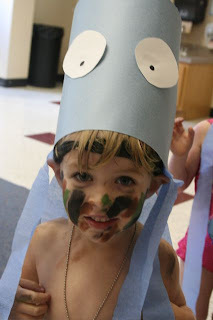 My second group of students had just finished boot camp, so while they weren't distracted with the anticipation, they were soaking wet and covered in war paint. Fun. The game we played was a hit. Can't you tell from the big smiles? 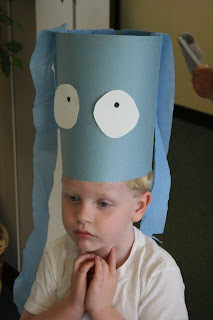 This student decided to make a bold fashion statement with his squid hat by wearing it upside down. He can pull this look off, don't you think? Here are photos from last week's class. Note the lack of swimsuits and dog tags. Last week we read Out of the Ocean, by Debra Frasier. It's a really awesome "realistic fiction" book I guess is how you would classify it. It's a story, but it's full of cool info and photographs. It worked great in this unit. I wasn't sure how receptive the students would be to it, but they liked it a lot. The photographs in the illustrations seemed to really intrigue them. The ocean brought us surprises! Above: Pelican feathers. Below: sea glass. I was so impressed with the details my students remembered from each story and activity this month. I had one student mention the big Tuna Fish from Swimmy while we were discussing the various sizes of sea creatures in I'm the Biggest Thing in the Ocean. 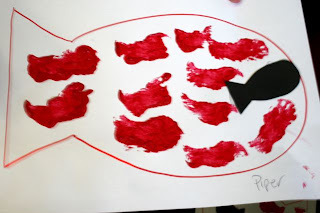 And just about everybody remembered specifically what treasure they found in our "ocean" during last week's lesson. I love my students! They're brilliant! Someone Just Got a Book Nook Upgrade!! Momma Snail!!! 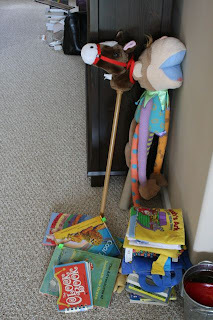 You just one a new book shelf in the Book Nook Giveaway! Hooray! Congratulations! I'm telling you, people. You should enter my giveaways because you always have a GREAT chance at winning! Momma Snail and Idea Mommy were my only two who entered. Thanks, ladies! If you haven't yet checked out their blogs, you definitely should! I have more to post today, but it will have to wait till I get back from my women's Bible study this evening. It's been a busy afternoon folks, sorry! I have some fab photos of my students to post though, so stay tuned!! And Momma Snail, your book shelf will be on its way soon! Enjoy! Promote Literacy... Buy a T-shirt!!. 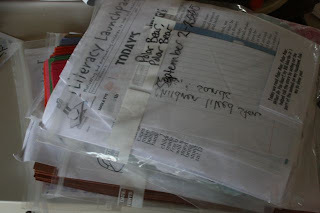 A while back I was reading a blog post about promoting literacy. There were ideas of how to this (promote literacy) being thrown around in the comments section. The idea of putting the message on a t-shirt was suggested and so... here you go! 1. You get to wear it around, look super cool, and make everyone else jealous! 2. You're promoting literacy to everyone who sees you sporting this bad boy! These are standard t-shirts. They're not fitted or anything, so gals AND guys can wear 'em! 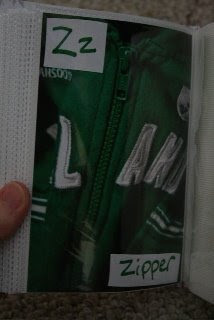 Since it costs money to have these made (of course), I only have a limited number to sell in this first batch. More will be ordered when supplies start to get low. So get yours NOW, and spread the word!! ATTENTION (10/110): We currently only have smalls and 2XLs. My need to clean is something I am working to overcome. It's necessary that I overcome this, because frankly, I DON'T HAVE TIME TO CLEAN! It's the one thing on my to-do list that matters the least, but it's the one thing I probably end up devoting the most time to. WHY?? Because for me mess = stress. I get paralyzed in a mess and can't function till it's cleaned. 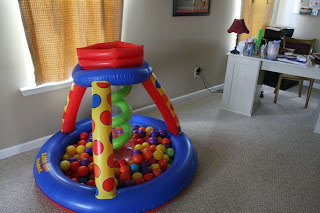 Check out my office and see why I haven't been feeling very motivated to be productive lately. Please note, I use the term "office" very loosely. It's more like a storage space. My office is wherever Isaac is. Or it's the couch if Isaac is in bed. 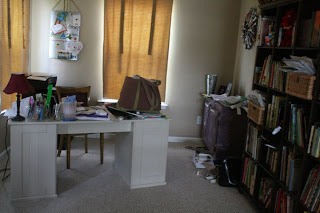 Yup, that's right folks, reading, planning, writing, cutting, gluing, preparing... None of it happens in this space. Looks are very deceiving. Having this beauty in my office doesn't help matters any. I need more bookshelves. I have stacks on the floors, and boxes of books in our storage closet just crying out for a home! 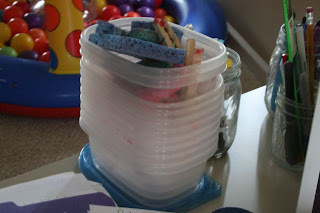 Containers and supplies used for painting projects. Where do I even put these? Add storage cabinet to that wish list of mine! Love this bag for toting my stuff in each week. It's like my very own Mary Poppins bag. Everything just always seems to fit. I can't always lift it... but it all fits! Don't you love my collection of dried-up pens and unsharpened pencils? I love my office... when it's clean. I wish I was able to spend more time working in it. Someday. 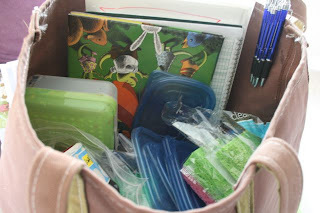 Till then, it will continue to un-effectively store all my supplies, books, and garbage. Coming Thursday: Book Nook sharing! And this time there's a GIVEAWAY involved. 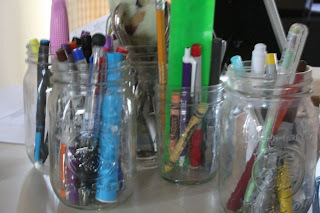 So snap some photos of your space and get ready to post them later this week to be entered to win a prize! ... 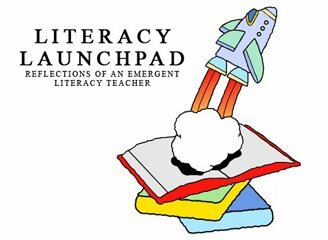 It's Literacy Launchpad! Hee! We're reading ocean stories during the month of July! I'm really enjoying the extra time I have with this summer session to squeeze in some of the fun units there isn't time for the rest of the year! This week we read Leo Lionni's Swimmy. The tale of a tiny fish, who teaches his tiny fish friends to work together to scare off the bigger fish and stay safe! 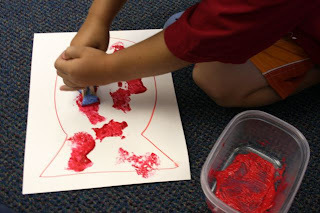 After reading and discussing our story, we did an art project to help us remember today's story. How Do You Bedtime Story? 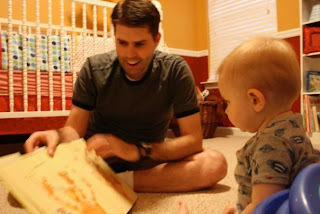 My son, Isaac, is only a year old, but our bedtime story routine has gone through several changes already. When Isaac was itty bitty he sat all swaddled in my arms while I read him sweet stories. He was this little blob that couldn't do much other than sit there, so he was content to let me read him story after story. Any kind of story. Any length. It was great. My favs at this time were Dr. Seuss. The long Dr. Seuss stories that dance off your tongue as you read them aloud (I especially love The Lorax). Ahh. I miss having a captive audience to read these to. Then Isaac became more alert, attentive, and engaged during our bedtime stories. I couldn't read him long stories anymore, but he would sit and listen earnestly to short board books as we rocked back and forth in the wooden rocking chair next to his crib. He would even turn the pages when I prompted him. Isaac had his favorites, and he really seemed to cherish these bedtime stories together as much as I did. Now, it's a totally different story. Isaac is all over the place, and not interested in slowing down. Ever. Especially to cuddle during a bedtime story. Bedtime story time now generally consists of me sitting on the floor, reading a story aloud while Isaac crawls around doing his own thing. He still has favorites that he will sometimes ask me to read (he picks them up and hands them to me, or points to them). I usually get a couple pages into the book and then he throws a different book at me. If he's crawling around and playing while I read, he does come over from time to time and listen attentively for at least a few seconds. I anticipate that our bedtime routine will continue to change and evolve as the years go on. I sure hope it does! I'm looking forward to reading chapter books together, sharing my favorites with him, and discovering new stories together. Before long, I'm sure our bedtime story routine will include brothers and/or sisters. And I eagerly anticipate the day when Isaac will want to read me a bedtime story. What's your current bedtime story routine? What works for you? What doesn't? Please share! Happy Birthday My Little Reader!! My Little Reader turned a year old this week! On the fourth of July to be exact! He's our little firecracker! Happy birthday, Isaac! 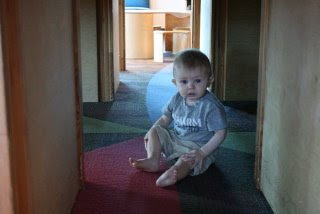 My son Isaac does not usually travel well. A messed up routine, missed naps, and overstimulation usually make for awful, sleepless nights for us all when we go to visit out of town family lately. So before this current trip we're on, I decided to make a couple books that might help remind Isaac of home, and remind him of his usual routine, even if we're not sticking to that routine very well these couple weeks. 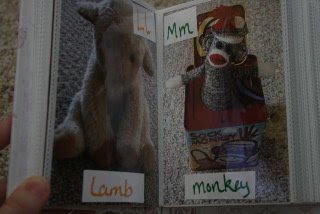 You can make a homemade book about any topic. 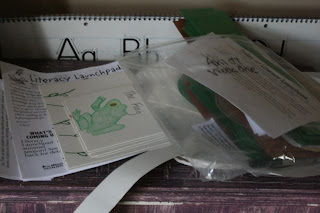 I chose to make an alphabet book and a bedtime book. Our alphabet book is full of photos of objects that Isaac knows and loves; mostly toys, but also his kitty cat, his Auntie, our yard... It's not as easy as I had anticipated to get the perfect photo for each letter of the alphabet. In fact, I didn't have anything good to photograph for "X," so there's nothing on that page other than the letter. Oh well! I used a small photo album I already had to put the photos in for each book. My photo album had enough pages that I was able to use it for both books! Open it on one side and it's Isaac's alphabet book. Then turn it over and it's a bedtime book! This feature is especially handy for traveling: compact, and easy to keep track of. 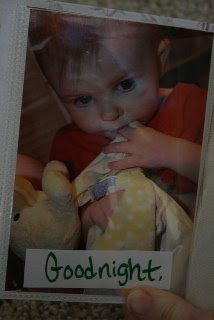 Notice that I simply cut and taped small pieces of paper onto each photo to create the text. You can get fancier if you have more space in your book, or if you want to utilize your printer or get fancy with stencils or stamps. I was short on time while getting ready to head out of town, so due to time constraints, I stuck to writing the text with a marker. Oh, and you obviously can create your book using something other than a photo album. I would have preferred to assemble my pages all pretty on some paper and then to laminate each page, but again, time was an issue while making these. Isaac loves his books. And so does his cousin whose home we're staying at. And now her mom (my sister) is making one of these books for her too! AND we're all getting great sleep on this trip! It's gotta be these brilliant books, right?? 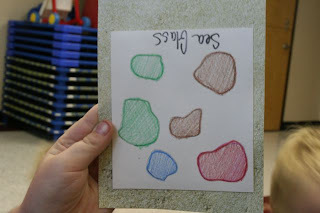 Ever made your own books with/for your child? How did you do it? What was your book about?? What Makes A Library Story Time Good?? 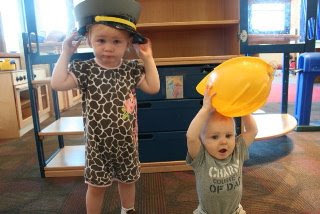 Tagged along with my sister this week to a baby and toddler story hour at her awesome, local library. Pre-registration was required for the storytime, but it's free, and so the librarian leading the story hour let me crash this one time. How nice! Thank you, nice librarian lady! Felt bad though, because there ended up being more people there than there were carpet squares to sit on. Oops! For being such a big, nice library they sure did have a tiny storytime room for us all to have to cram into. Anyway, onto my big disappointment... the storytime sucked. Really sucked. The librarian read three stories. (In between the stories there were fingerplays, songs, and dancing.) The stories were so rushed! The text was simply read. Granted, she did read it enthusiastically, and in a funny little voice. But there was no discussion. No talking about the cover or illustrations. No questions. This was especially disappointing when she passed out a board book to each child/parent pair to read along with her. My son barely had a chance to glance at each page before she was onto the next. So after the 15 minutes of rushed reading and singing, toys were brought out and it was a free for all with the toys for about 15 minutes. I'm not sure if the librarian had a book quota she was trying to meet during the read-aloud, but it seems to me like it would have been a much better story time if she had cut back on the number of books and spent more time with the reading of each. 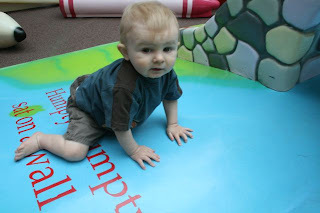 Or shorten the playtime and use that time instead to give a more meaningful read aloud. This story time was so sad to me, because as parents, we look to librarians to model how we should be reading with our children at home. This was a horrible example. Perhaps I'm being a bit harsh on this librarian... She may have just been having a bad day. But from what I gathered from my sister, this was pretty typical of what the story times are usually like. Compare that story time with the story time at my local library: A full half hour spent giving lots of time to the reading of several books, pointing out details in the story and illustrations, talking about the ideas presented in the story, engaging parents and children in fingerplays (and always repeating each at least once), giving helpful read aloud tips for at home, suggesting great books for additional reading together, giving info about other events coming up at the library, and all in a big room to spread out in!! 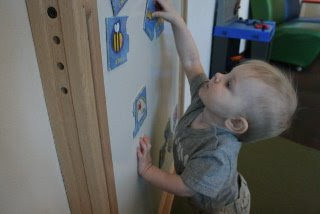 Although my sister's library didn't have a great story time to offer, they do have an amazing children services area!! My library's can't compare. Actually, my sister's whole library building is pretty amazing! 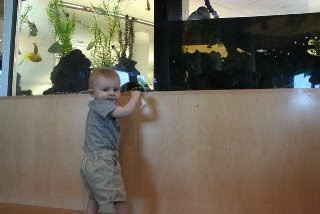 Check out these photos of Isaac having a blast at the library earlier this week. 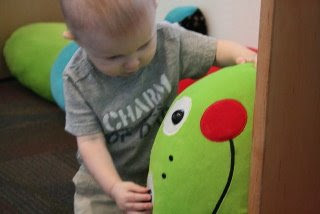 So what would you say makes for a good library story time? A big thanks goes out to all who donated to our adoption fund during our raffles. And thank you to everybody who helped spread the word through Twitter and Facebook! 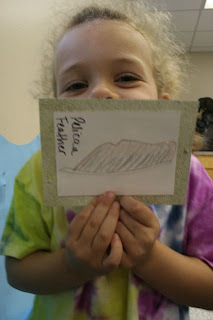 Between our Wii raffle and our Itty Bitty Bookworm curriculum raffle we raised almost $600! !